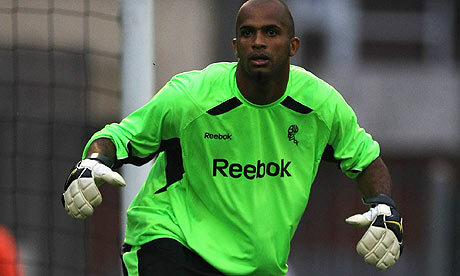 The on and off transfer from Bolton to Wigan has now been resolved and Ali Al-Habsi is now a Wiganer. After much wrangling an undisclosed fee (probably £4m) was today agreed by the two clubs and Ali signed a four-year deal. It was always clear that Ali wanted to come to the club where he had performed so valiantly on loan last season, but Bolton held out for a somewhat inflated fee. The 29-year-old was so impressive last season that the latics fans were desperate for him to sign permanently. When Ali broke into the first team at Spurs few people (except perhaps Roberto Martinez) expected him to make such an impact. His faultless performance in a crucial 1-0 away win turned around latics season after the two early heavy defeats against Blackpool and Chelsea. It is no exaggeration to say that without Ali’s performances Wigan would probably not have survived in the Premier League. During his tenure he kept eight clean sheets and the team went onto register their fewest defeats during their time in the Premier League. Ali was voted player of the season for 20110/11 and if he continues where he left off last season he will play a crucial role in Wigan’s progress further up the league table. Ali is now truly a Wiganer and of course…… he hates Bolton. This entry was posted in Ali Al Habsi, Bolton Wanderers, Transfers, Wigan Athletic and tagged Ali Al Habsi, Bolton Wanderers, Transfers, Wigan Athletic. Bookmark the permalink.